I think it’s also funny to look at the number of victims of terrorism each year in America compared to the number of bathtub related deaths in America. No, because then the terrorists win! Amazing. To prove your point further, could you add the number of Iraqi’s allegedly killed by Saddam before the invasion? I imagine it will look insignificant to the number killed afterwards. You forgot to mention who is killing these people. The implication is that the US is killing them. In fact it is extreme Muslims killing civilians and other extremist. Guess who they are going to kill next if given a chance? Compare the number of deaths from terrorism to that of obesity, smoking and alcoholism in the United States; add to this comparison the money spent on “defense” and healthcare. You’ll get a clear picture of everything. pete brings up a good point; ARE these deaths caused by extremist muslims?? I don’t know who is doing the killing of Iraqi civilians, but does it matter? The United States has helped create the climate that allows for this kind of killing to happen. I do know that the U.S. military is downplaying their numbers. For a casualty to count they must die on Iraqi soil. So if a soldier is critically injured and shipped to Germany for treatment (as is what often happens) and dies in Germany, or even just on the military medical plane. It does not count as a war casualty in the announced numbers. The military knows what these death tolls do to public opinion, and is working hard at keeping it vague. Jesus, it takes an online blog that writes about diet pills that make you poo oil to throw these numbers together. That my friends, no matter what side of the isle you are on is a sad state of affairs. Well, it could have been Saddam killing them, or they could have killed each other, but it’s the US’s responsibility for the current chaos in Iraq. Just wondering what are considered British terrorist casualties? Are these figures including American finance killing of of British citizans by the I.R.A. I think your figures a little wrong. Between 1969 and 2001, 3,523 people were killed as a result of the Troubles. Approximately 60% of the victims were killed by republicans, 30% by loyalists and 10% by the British, Irish and Northern Irish security forces. There are 35000 babies killed each year in America by abortion. Your point is?? I would never use wikipedia as a credible source. Let me know when the count gets to “all of them”. I’m gonna echo Petru: Pete, I think we have to look at whose responsible for disabling the Saddam regime therefore creating the instability and attendant lack of security the invasion has bred, not to mention the motives behind the extremist attacks. As much as I would like to blame this on the naivete of American officials, I think its even more naive to assume that with our massive intelligence network and army of intelligence analysts we would have not foreseen the situation we are now finding ourselves in. We have enough experience replacing regimes to know how the delicate, albeit unjust, power structure in Saddam’s Iraq would react to our “pre-emptive strike”. The current situation serves our interest in several ways. Oh, so there are 35000 “babies” killed each year in America. I guess that makes it OK for Americans to kill (directly or indirectly by throwing a country into chaos) 7-8 times as many people in another country. So if a person kill 10 babies here, how many Americans can he or she come to kill in the US ? Are the 35000 “babies” killed by the American government and/or the military ? If each killing in Iraq had to be controlled and applied for like an abortion has to be in the US – how many Iraqis would have been killed do you think ? You’re goddamn stupid to hold those numbers up against each other – it just makes no sense. It’s frightening to consider how indifferent, or at least unmoved, America in general has been to Iraqi civilian deaths. To me, it speaks of underlying racism and nationalistic blinders that pervades the minivan drivers of this country. Pete: Agreed. The overall point was to show how many civilians are killed in Iraq compared to those who died in September 11th or other terrorist attacks. 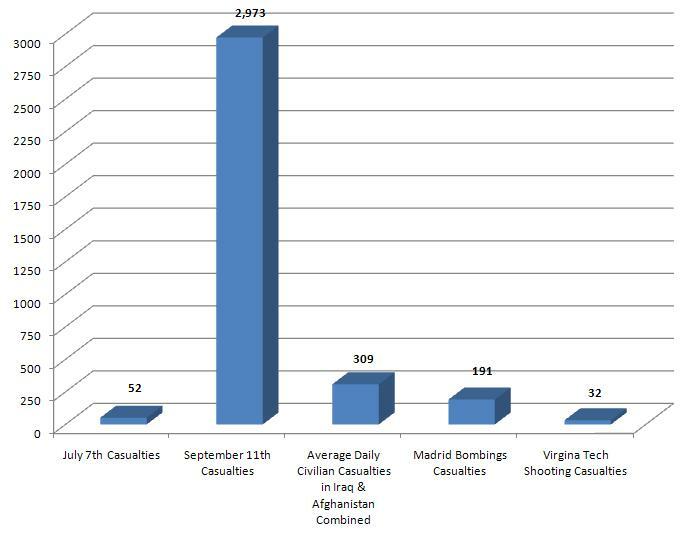 While we view 9/11 and other attacks in Western countries as large threats, people in Iraq & Afghanistan face the prospect of the same amount of civilian casualties roughly every 10 days. Teth: That’s correct — I’m only considering terrorist attacks in the recent years. The IRA obviously did a lot of terrorist attacks in England (and I’d say form a pretty interesting blue print for current terrorist movements). However, I’m trying to keep the correlation of how Westerners view themselves as victims of Middle Eastern terrorism versus how things are actually going in countries in the Middle East where Westerners are involved. And yes, Wikipedia was used but mostly for its sources, not for the entry or data provided. I understand the confusion, but did not want to list out 10 to 20 sources for my data and methodology when it may be confusing and take away from my point. Everyone else, thanks for the comments. Was “(see British-government funded Iraq Body Count below)” a throw-away line, or can you point to documentation showing that IBC is funded by the British government? It seems hard to find information on this other than it is run by volunteers, is not a charity, and accepts donations. Guess who is arming the “extremists” in Iraq, with the exception of the marginal al-Qaeda elements who form a small part of the resistance to the occupation? Hint: It is a large country in the center of North America between Mexico and Canada. The US is still closely involved in the Iraqi Interior Ministry, known for Shia death squad activity, arms Sunnis (as just reported last week) and uses Kurdish pershmergas to attack Sunni resistance forces in cities like Fallujah. So, yes, the US can be held responsible for the vast majority of deaths in Iraq since the invasion. But, then, that’s how empires justify perpetual occupations of other countries, by inciting existing ethnic and religious conflicts, arming the participants and then claiming that they must stay to stop them from killing each other, which they do in ever increasing numbers under the watchful eye of the occupation. I suggest to allposter Morons that DON’T Get It Yet, 911 was not done by anyone Arab. Try zero Terrorist killings on USA soil. Regardless of accepting his new figure I suggest that you accept the work of several noted scientists published in the Lancet, a prestigious British journal for medicine, with professors from Johns Hopkins University and the School of Medicine at Al Mustansirlya Univesity in Baghdad. Regardless of accepting his new figure I suggest that you accept the work of several noted scientists published in the Lancet, the preeminent prestigious British journal for medicine, with professors from Johns Hopkins University and the School of Medicine at Al Mustansirlya Univesity in Baghdad. The point that Pete is making, and the point that Petru is missing, is that this type of activity is not new. Those that think it is only started watching and reading the news after the United States went to war, because at that point it became fashionable to attack the US government. dissolving Saddam’s regime did very little to increase the amount of Iraqi civilian deaths, and absolutely nothing to affect these numbers in Afghanistan. 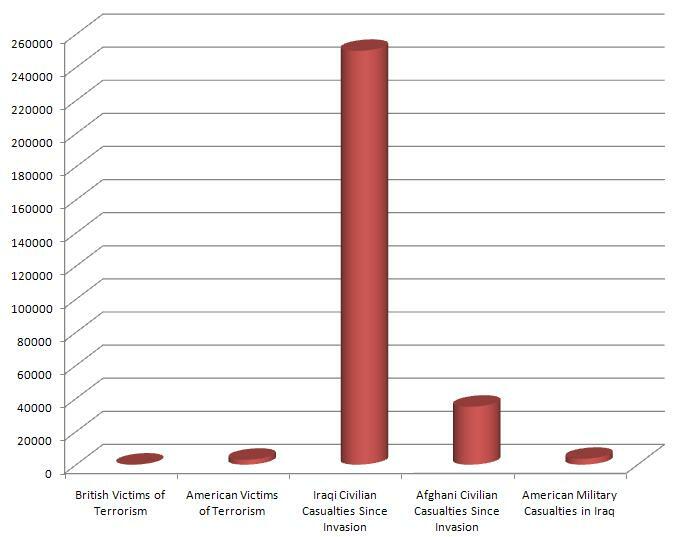 I think if this graph showed the number of civilian deaths before the US did anything in the middle east, the numbers would be near the same. Good luck finding the figures though, I imagine they’re buried beneath vast layers of fake numbers to “verify” such “shocking” numbers and revelations as this. the Lancet survey was specifically about excess deaths caused by the invasion of Iraq. You seek to excuse hundreds of thousands of deaths as a whim of fashion? “before the US did anything in the middle east” when was that? Shall we take the 1953 overthrow of Mosaddeq in Iran as a starting point for large scale interfrence, or do you want to go back further? Alec: I concur with Teth, although your use of more recent acts of terrorism does eliminate most IRA related deaths. Still, on 9-11, there were 67 British nationals murdered. (http://news.bbc.co.uk/2/hi/uk_news/3646682.stm), so again, your statistics should be corrected. I would also take umbridge with not counting the IRA related deaths; The British have been dealing with terrorism (largely US funded) for years, thus their reaction to 9-11 should take this into account. Having said all that, it still would not come anywhere close to the tragic and largely avoidable deaths of innocent civilians in Iraq and Afghanistan. My therapist agreed that was a pretty tactless thing to tell a six year old who only wanted a baseball glove. I understand the IRA targetted Britain for a while, and I would never remove the term terrorism from the majority of their actions. However, you’re missing the point: I’m trying to shed light on the ‘clash of civilizations’ notion that people are hung up on and the perception in the West that they are the greatest (and likeliest) victim, when the opposite is true. Medical transcription is a lucrative profession which allows you the flexibility to work from home. Unfortunately, it’s this appeal that has opened the doors for less than honest online medical transcription schools. If you had so many other sources why use the least credible? Seems to me that ignorant people like to attribute several hundred thousand deaths in Iraq and Afghanistan to muslim terrorism. this is presumptuous and false. i know its hard to think about how many people have died because you voted for evil jackasses that act in the best interest of the financial elite (not that we’re given any legitimate, altruistically acting options when voting,) but trying to pull the wool over more people’s eyes is despicable to me (even if you don’t realize how brainwashed you are.) Billions upon billions of tax dollars aren’t spent on these wars for the common good, its to make rich people more rich and more powerful, at the expense of millions of people in the bed of humanity. and the ludicrously excessive military budget isn’t even directed towards taking care of our soldiers. wake… up. research, think outside the box. Using wikipedia just ruined the credibility of your report here. Also, Muslims kill more of each other in Iraq and Afghanistan than we ever have. Another skewed liberal report here. When we speak of terroist what do you call the CIA . Training terroist and assasinations in Ft. benning, Ga. to cause civil unrest in third world countries resulting in over throw of goverment in favor of one who will bend to the US goverments will. An organization that from 1947 until 2008 is responsible for the death of over six million people. Mostly civilian. Of course they have the backing of congress and the president even though they aren’t a goverment agency. Have to give them credit. They have removed some famous dictators and also put some in office. Some by assasination. These incidents are public record now. Saddam, Oaddafi and Noreiga. All three were used and discared by the CIA. All the weapons Saddam had were given to him by the US to overthrow the goverment of Iran. Everyone knows this war was illegal. As was the Vietnam War and so will be Libya and Iran. The only one who uses weapons of mass destruction is the US. Uk and France. 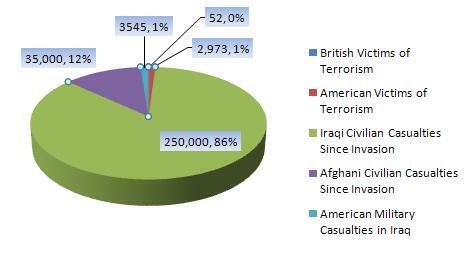 Iraqi civilian casualities since invasion 250,00. Afghani civilian casualities since invasion 3500. They totals are on the low side. How many so far in Pakistan and Libya? The Bilderberg Group and The Trilateral WWCommision are saying well done Bush and Obama. We will achieve our goal. i was surpised to learn Obama,Joe Biden, Bush, Clinton,and Kissenger are five of the 130 members. Personally, i feel like we have little hope. people need to read and understand the goals of these two groups. THis is stupid…whaere do you get your information? how are you even putting these numbers up here? Irag and Afganiwhatever dont have any way of monitering their populations…who is making these estimates? GFY and how dare you compare those worthless deaths in a sand whole to the great americans who died on September 11, 2001. People seem to think that there was no unrest in the middle east before the 9/11 attacks. All these people commenting, getting their information from what they have seen in the newspapers and on the news. Everyone thinks the unrest started after 9/11. It didn’t. Sure, there was a little more unrest following the attacks but had the US not gone in when they did, I can confidently say that more casualties would have resulted. It’s the lesser of two evils to me. Not to mention taking land away from them to give to the jews, who hadn’t ruled israel in over 1000 years. Of course, if someone tried giving a large portion of the united states back to the native americans, I’m sure we’d graciously accept the offer. And if every year they illegally settled a little more of our side of america, ignoring the established borders, effectively making it their own, I’m sure we would be thrilled and welcome our new neighbors. Just like so many americans are thrilled by our mexican neighbors.